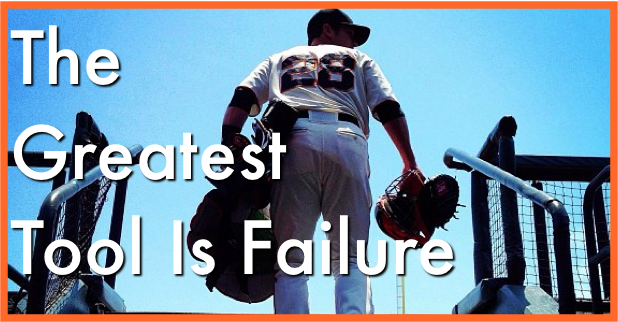 The greatest tool is failure- By far the greatest tool that a baseball player can have beyond his arm strength, hitting ability, power, speed and control, is his ability to handle failure. How a player deals with failure makes the difference between a player who’s accomplished and one who is not. A wise player once told me that out of the 1,000 times you run down first base, 700 of those times you’ll be taking a right turn back to the dugout. We’re playing a failure man’s game. But isn’t this thought liberating? We’re going to fail. There is nothing that we can do to avoid it. So why get upset after a strike-out or after an error? There really is no reason. Understand. Hidden within each failure are the seeds of success. The next time your fail…be so focused on what adjustment that you need to make in order to succeed in your next opportunity that you have no time to seconds guess yourself or feel the emotion of regret. Choose to respond positively to failure and you’ll have the advantage. Choose to learn from each experience as a ballplayer and you’ll achieve peak performance. What have you been struggling with lately? How have you been challenged to deal with failure as a baseball player, parent or coach?